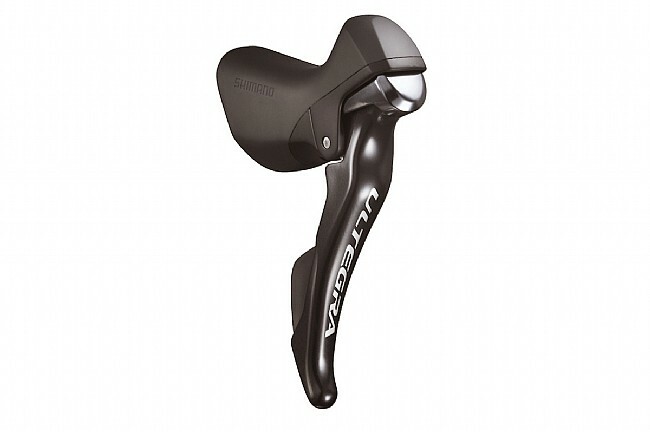 One of the most anticipated components of the season, the Ultegra ST-6800 Shift/Brake Levers deliver Dura-Ace features, and 11-speed compatibility, at a more obtainable price. The new lever design works in perfect harmony with the 6800-series front and rear derailleurs. Each of the group's mechanical components has been redesigned for nearly effortless shifting, with a claimed 30% reduction in lever movement required per shift. Combine this feathery actuation with Shimano's new low friction PTFE coated derailleur cables (included) and you've got incredibly fluid, precise shifting right at your finger tips. But lever actuation is just one of the improvement Shimano brings to the table. They've also re-shaped the lever bodies and hoods emulate the electronic Dura-Ace levers, slimming them down for a more natural feel in the hand. Reducing the bulk also lowers the weight, helping to account for the 13 gram reduction over the 7900 design. 10mm of reach adjustment ensures comfortable performance for every rider. The Ultegra ST-6800 STI Lever Set includes one left and one right lever. Shimano's SP41 Shift/Brake Cable Set is also included. Recommended for use with Ultegra 6800-series components only. Claimed weight: 425g. My Original 2014 Ultegra shifters finally gave up so I shopped for new ones. I got these at a near steal thanks to a sale at another on line store. But, I purchased from Bike Tires Direct based on prior experiences and their outstanding price match policy. The new shifters are lighter and require less action to complete a shift. I've ridden a lot of different setups over the years. I was beginning to think the only way to get amazing shifting was to go electronic. I bought these out, slightly begrudgingly, out of necessity. WOW. They're amazing. Paired with the Ultra Slick cables and housing and the new Front D, they are the best shifting I've ever experienced. I like it very much compare to my campagnolo. This is a very solid feel. Good braking power. I upgraded from the older ultegra 10-speed shifters to this one. The 11-speed works well. I installed it and the derailleur myself and worked like a charm. You can download the installation manual from Shimano's web site, which was helpful.